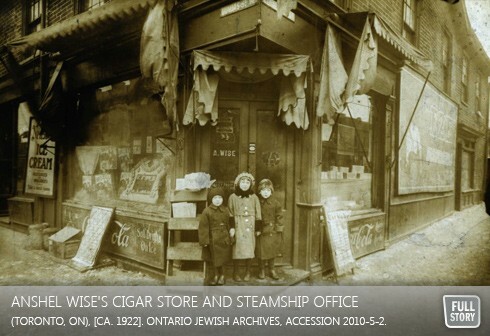 UJA Federation’s Ontario Jewish Archives, Blankenstein Family Heritage Centre is pleased to announce the launch of its new and improved website, accessible now at http://www.ontariojewisharchives.org. The website includes several exciting new features, most notably a searchable online database of archival descriptions and an interactive map of Jewish neighbourhoods. Visitors to the site can now access over 25,000 entries describing the records in the holdings of the OJA, including textual records, photographs, videos, architectural drawings, objects, oral histories and more. This dynamic and engaging website is suitable for all levels of cultural exploration, from in-depth scholarly research to casual browsing. OJA Director Dara Solomon says, “One of the most important goals of this project was to make the incredible collections of the OJA accessible to everyone—our grandparents, our school-aged children, and of course, the scholars of Ontario’s Jewish history and heritage. This goal was kept in mind throughout the project’s development and is obvious in its design, easy-to-use navigation, and browseable content.” The website boasts a streamlined design and search functionality, allowing users to quickly and easily access the OJA’s diverse range of records documenting Jewish heritage in Ontario. Nearly 4,000 photographs and dozens of oral history and film clips are accessible through the site. Curated content in the website’s themed section highlights historically significant people (artists, community leaders), organizations and topics, such as architect Benjamin Brown, Jewish Immigrant Aid Services (JIAS), and anti-Semitism. This section tells the stories of the community’s history in accessible language and showcases archival material such as hand written letters, speeches, drawings, and photographs. The Online Exhibitions section celebrates the OJA’s award-winning cultural displays from its 40-year history and provides even further access into the depths of the organization’s archival records. These exhibitions include Toronto’s First Synagogues and Ontario’s Small Jewish Communities. Plus, the groundbreaking Landmarks feature allows users to search for significant building sites on an interactive map of the province and to learn through text, photographs and oral history clips about Toronto’s Jewish built heritage. The website will premiere with the sites of Kensington Market, and other neighbourhoods and Jewish centres will be added over time. The design is mobile-friendly, meaning that visitors to the site can explore Jewish heritage from wherever they choose and on any device. Whether you are at the day school or the synagogue, the community centre or camp, or just walking down a street, the province’s Jewish history is at your fingertips. The creation of the OJA’s new website was made possible through funding provided by the Government of Ontario. Additional funding was provided by a group of generous community supporters.